In general, most people have found that once they have tried using a monopod, they have really enjoyed its convenience, light weight and its image stabilizing properties. The only common shortcoming reported in reviews is the lack of versatility without having a ball head for its extra versatility. If you are strictly shooting photos with your camera aimed horizontally, a ball head or pan head is just extra weight. For many, it's not a lot of weight; but for others, one of the big reasons for using a monopod is its lightweight. The ball head adds so much more usefulness in terms of shooting at angles, particularly aiming your camera upward or downward. You can add stability to your monopod by having it rest or leaning it on a second contact point somewhere along its leg to a stationary object. Having the ability to have your camera mounted an an angle is critical in a situation like this. The other obvious benefit of having a ball head on your monopod is the quick and easy adjustment from changing between vertical and horizontal compositions. If you want the best quality monopod, there is no substitute for a Gitzo. Any Gitzo is a great monopod if price is not a factor for you. Gitzo monopod reviews come in with almost all 5-star ratings at Amazon. That is very impressive. For most people though, a high quality monopod like a Bogen-Manfrotto or a Slik is much more affordable. If you have a light DSLR with a standard lens or small zoom, or a point and shoot camera, a cheaper model of monopod will really suffice. Remember to treat plastic parts on cheaper monopods gently and consider a monopod that has the option of a decent ball head. The canon model 500 monopod has a problem holding medium to heavy camera and lens combinations. After reading other monopod reviews on Amazon.com I realized that you can easily overcome the shortcomings of this tripod. 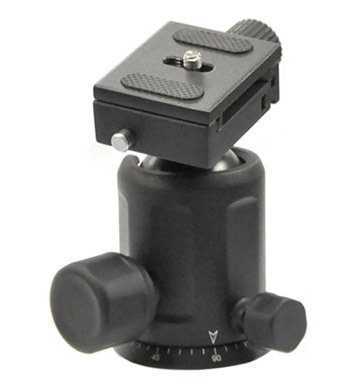 The ball head does not support heavy weighted cameras because it is smooth plastic and not a heavy duty ball head. If you lightly roughen the ball's surface with sandpaper, it will add a little friction so that your camera won't slip when you tighten the knob with moderate pressure. The cannon 500 easily extends tall enough for a 6 foot tall person to use without bending over. It is a lower mid-range priced monopod that is sturdy and a good value for it's price.